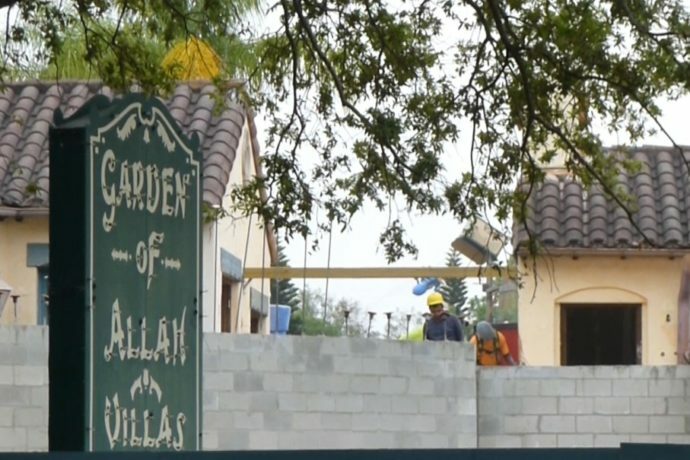 With most of the attention on bigger things like King Kong and the new water park it’s easy to miss the smaller construction projects, so today lets focus on the work being done over at the Garden of Allah Villas in Universal Studios Florida. As I previously stated it does indeed look like the two buildings are being connected. Slowly, but surely, progress is being made. No one is quite sure what this will end up being. Check out the video and pictures below! Originally it was rumored to become a museum for Universal’s 25th anniversary, but that no longer seems to be the case. Screamscape has said that the inside of the buildings are being remodeled into series of conference rooms, equipped with several monitors mounted to the walls. Permit filings show the name of the project as “NBCUniversal Media Lab”. Perhaps Screamscape is right, because there is already a NBCUniversal Media Lab in New Jersey, for employees to test out new technologies. Maybe the Media Lab coming to Orlando will be a hands-on exhibit where park guests can experience the newest technologies themselves. Only time will tell. For now, check out the construction progress below and stay tuned for more updates. It looks like not only will the new wall connect the two buildings, but will also have doors. And notice the new door being added on the right side of the building as well. Looks like the old entrance doors are being walled up here. Perhaps the new entrance will be from the front through the new doors being added. See the pictures from the last update! And learn the history of Garden of Allah area, including what attractions these buildings used to house. I saw the pictures of the construction which I’m so happy about but Is the gray brick building going to be the new e.t. ride entrance? I hope to god it is.